Jesus said, "Let the little children come to me, and do not hinder them, for the kingdom of heaven belongs to such as these" (Mat. 19:14). Charis has been asking us for over a year or so if she could be baptized. A baptism came up at our church last month, and it just happened to be on my mom’s birthday. The week before, Charis and I took a class on what baptism is all about. 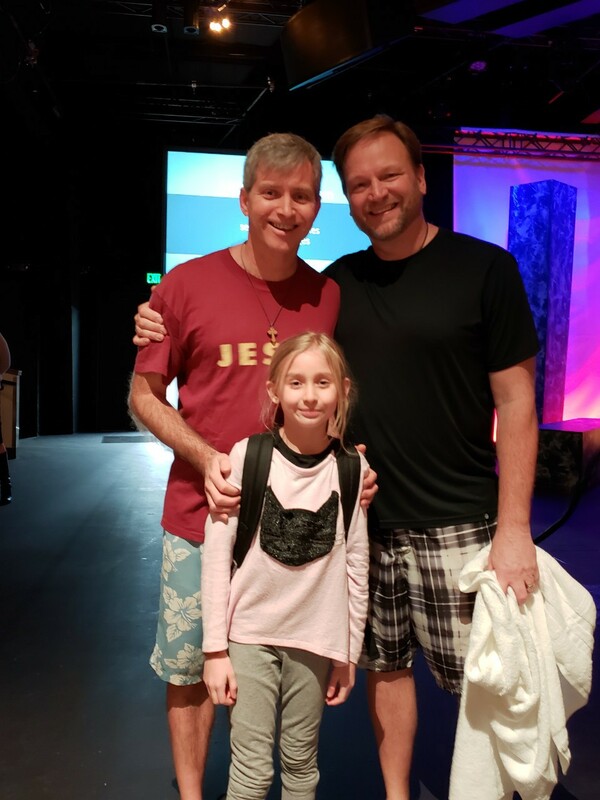 Our pastor, Dave Nelson, allowed me to baptize Charis. He stood in the tub with us. Obviously, we are so proud of our daughter for making this decision. You can watch the short clip here. Russ and Carmen Hayes came to share their story out of Mormonism and into Christ. Please see their wonderful testimony and the pictures on our site. My dad and I will be attending the last week of the temple opening in Rome, Italy and leaving on February 8th. My brother Greg from Serbia and his friend will also be coming over to help during that time. I will be speaking at the Rome Baptist Church on the 10th. I have started receiving the translations to my tracts from my translator friend in Rome. If you’d like to read the tracts, please go to mormoninfo.org/tracts-13. Please pray that the rest will be done before we go. Certain Protestant evangelicals have assumed that I don’t preach to Catholics given my stated position on them, which is the same as Dr. William Lane Craig, Dr. Norman Geisler, Ravi Zacharias, and the late Dr. Walter Martin. They have the same position as most other Protestant scholars familiar with the subject. Having said that, I have led many Catholics to trust and live for Jesus just as I have with others who belong to various denominations. Please pray that God will work all the details out for this trip, that many would come to know the Life, and that many would be warned of the false god of Mormonism. Please check out our new store pages! The primary one is on MormonInfo.org/store, however we have one on CourageousChristiansUnited.org/store, JWinfo.org/store, and MuhammadLied.Info/store. Only the last one doesn’t have any merchandise on it yet. You can purchase the products online via PayPal or you can simply mail a check in and tell us what you’d like. We only ship within the US. All proceeds go to support this 501c3 non-profit ministry. I went after the false teacher Shawn McCraney on a mutual friend’s Facebook page, and Shawn just happened to jump in for a quite entertaining exchange. I printed it on my blog page as Shawn McCraney Revisited. It clearly shows that Shawn is still worshiping some other god than the Triune God of the Bible. His coaxing to get me to come on his show is about as tempting as debating Jesús at the local mental institution about him not being the second coming of Christ. I received your email informing us about your upcoming trip to Rome, Italy. As I was watching the YouTube videos found online of the LDS organization promoting their new Temple just outside of Rome, my heart breaks. It.just.breaks. The LDS people are so deceived, and our hearts are burdened for them. While we are unable to go, my lovely wife… and I would consider it a privilege to be able to do what we can to help in supporting your trip to Rome. Please know that we are praying for you and your team for discernment, for wisdom, for the power of the Holy Spirit as you go as a witness to those who are unknowingly under the influence of that wicked one, ie: members of the LDS “church”. Do you remember that “man-ism” (as I call them), that saying, “Give ‘em hell!”? Well, I’d say that to you, Rob, but being born-again, it just doesn’t seem appropriate, on more than one level. Give ‘em Jesus, Rob (the true and living Jesus). Give ‘em “grace”. Give ‘em the truth. Since 2018 I've been driving around KC with mormoninfo.org on the rear window of my car in stick-on white stencils. Since discovering your website, it has been my goal to drive people, both LDS and non-LDS, there so they can become educated as to the differences between the two religions. As you know, many non-LDS are fairly ignorant of the deeper LDS teachings, and those who are LDS really have no idea the scriptural teachings on many fundamental biblical doctrines. I see your webpage that lays the two out side by side as a great way to give people some basics. Kansas City is an important part of Mormon history. I literally live within this "triangle" of the Kansas City LDS Temple, the Historical Jail in Liberty, and the Temple Lot in Independence. I've witnessed in person at each one. I exercise gentleness, respect, and compassion when speaking with others about what they believe, and why I am asking them to consider the testimony of God in the Holy Bible. God Bless you as you witness in Rome! I am on disability; otherwise, would send you some money. Will pray that God will show them the light of your preaching. Every blessing with your planned Rome outreach, sounds awesomely exciting! Thanks for all the good news letters and I pray your visit there continues to bare much fruit and you all have a great visit and safe successful mission trip and many see your sign to help them come to find our blessed Lord Jesus, God speed brother, keeping you in prayer now until then and those lost that need reaching out to and I pray I have something to donate before you go and the doors of support open up for the trip to come, God be willing. …Thanks to the Lord and to yourself brother, really encouraging news to receive and to be teaming up with your dad and brother, must be really exciting and to hear your making friends and disciples and spreading the gospel outreach to Mormons in Rome its just awesome bro! ! ! Praise the Lord! I can only wonder what the Holy Spirit of the Lord will do in His great labor with you all and I am grateful you share your experience's brother and encourage others alone the gospel journey, thank you and I hope and pray this is an awesome experience and blessing for your ministry and the free course of The Word in Rome through CCU. …I received a bank statement just after reading your news letter and was praying regarding a donation, thinking I know what I should have which would be short, plus Satan buffeting my flesh to be against it, and to my surprise it was much more and to the praise of the Lord I could afford a donation and I am thankful to offer and give it in service and faith, if I could afford the full amount I would give it but that wouldn't be part of in the faith I suppose and I am certainly praying and will continue to, for the financial support, the prayer support and The Lord's support and blessings. You really are courageous! I cannot travel to the places you and your wife do, but I can certainly pray for both of you and your for your mission to reach out to those who are caught in the bindings of that cult. While the lies they tell seem so obvious to me, I believe that Satan has a tight hold of them and I keep praying that their eyes will be opened. The efforts of Christians like you are their only hope. Blessings to you on your trip! I pray to see the fruits of your trip!